Britannia International Movers relocated from Croydon to Merstham to create more area for their moving and storage business and as part of the relocation move, Britannia invited us to provide a fast solution to two open office floors and offices. The main criteria were the delivery period as the time frame was 10 days until the staff moved to the new site as well as computers and security was of the utmost importance. With discussions completed, it was decided that our wide-bodied heavy duty commercial vertical blind system would provide the required vision, light control and solar protection, security and provide everything required in our brief. 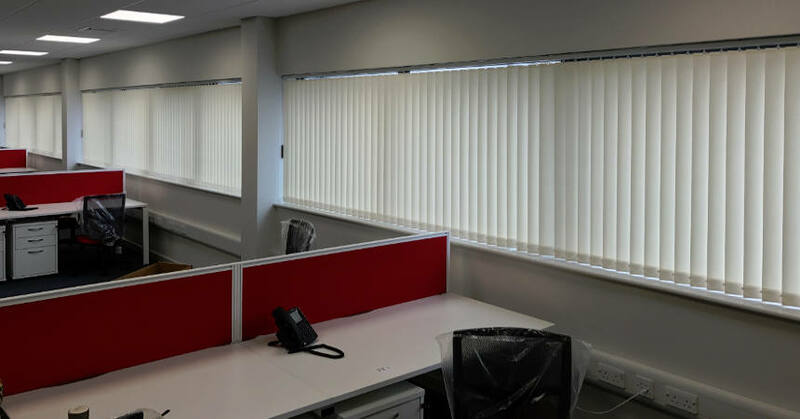 As a manufacturer our greatest asset is producing large volumes very quickly so setting to work, we produced vertical blinds in a contract FR rated fabric and the installation was completed over a single day. The result was a very happy customer with one less worry with the relocation.